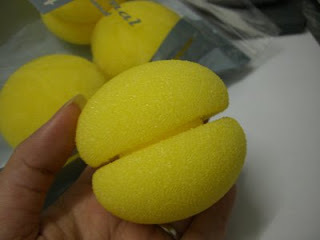 So these are those sponge curlers. They're often raved about in Taiwan talkshows. I bought 2 packs from Sasa which consist of 4 each pack of RM12.80. So i have 8 of them. However, 8 isn't enough. I need at least 4 more.....so the other 4 i use those old fashion, grandma curlers as substitute in which you will see in a bit. ahem ahem....Ms.Fash in her lingerie.OOooo........ok stop staring at my fats and concentrate on my hair. Here is my before pic. I have really straight hair. This is after a wash. So wait till your hair is about 90% dry.....Then you can start the curling process. so that the curls can hold longer. 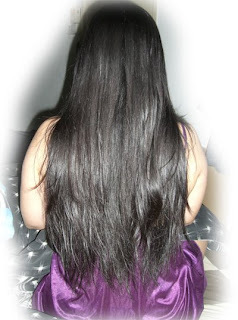 Otherwise, it wouldn't even hold for 2 hours lah.....my hair is too heavy n straight for it to stay curly. So this is after i've done them. use hair clips to clip up loose hair and work them section by section. Start with the tip of the hair. 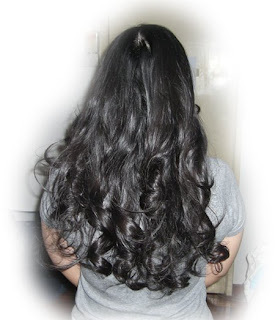 Slot them into the curlers and then roll upwards in any direction until the desired length. Miraculously the hair will hold in the sponge without any fastening. When you wake up the next day.....take those sponge curlers off and taadaaaa!!!!!! Of course, the secret to have them shiny is to spray some lucidol on them before you head out of the house. Of course, you CAN achieve the same results if you have the hair styling iron. I do have that too.........but it takes a LONGGGG time to curl all my hair and usually i do not have that time to spare to get myself ready for anything....especially work!! i only take 10minutes to get my make-up done so i have more sleeping time. hehe.........so with this option, i can do all the curling at night and when i wake-up, i just have to take them off and spray some lucidol and comb a little....thats it. Saves a hell lot of curling time!!!! hehe....bought them frm Sasa. For my whole head of hair i need 3 packs. I love it!!!!! Will buy them. Right now, my hair is about 1 inch from bra line strap. Gotta wait longer. But will definitely try it. So you spray the VO5 mousse before you put the balls right? Nice lah. Jomel - yeah, think you can try too. Just slight curls below will be nice and suit your girlie pink dress! Yes, don't think I didn't comment means I didn't read ok. I've been following! angie: nice hor? i didn't believe i can achieve this result too!! pleasantly suprised. Yes i apply the mousse on the strips of hair first then only curl. The mousse i use does not make my hair hard. But the curls will become almost straight by end of the day la.....if u use a stronger gel or something, may hold longer. But im not sure about the effect. I like my romantic curls like this. very natural. Better than paying rm500 bucks to perm hair and end up spoiling it lor..very nice leh. First time hear abt the sponges. will go check it out. Also I would like to ask a question. How long can we keep n use a cleanser? Im using ginvera UV white cleanser (the complete cleanser, etc). I saw the manufacturing date is 0606. I think is June 06. Coming this June, it will be two years.. should I throw it away? I have about 40g left. How long can one cleanser like this last? Wow, the curls are absolutely GORGEOUS! Without having to subject yourself to the heat and chemicals somemore. I have to try this out sometime. y3n: ya..dats what i thought too! i couldn't bare to spend so much to curl my hair...and i like the flexibility of being able to have straight hair when i want and curls when i feel like it. Umm....about your cleanser, i would suggest you to throw them already after 2 yrs. Get a new one, because hey its your face we are talking about here. Better be safe than sorry.There are expiry dates for everything....i will suggest not to use anything more than 2 yrs...cleanser is relatively cheap unlike cream or lotions. Get a smaller tube if u use less. Usually, squeeze about the size of a 10 sen coin. Tine: yah!! i agree. Very friendly to the hair. No damages because no heat or chemicals involved. 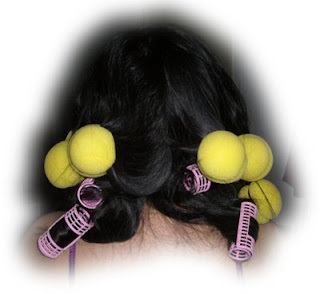 Plus the sponge rollers threat the hair better than the other conventional roller bcos its sponge. With the rollers, i had a little bit of a trouble with detangling my hair. Jemima: u have been very quiet these days... hows your moms condition? paiseh paiseh. thanks! I'll see what I can do with the cleanser in one month. I mean, is quite a good cleanser. cheers and happy hair day! i want straight hair I want curly hair. walah! Your hair is soooo long and black and thick !!! and btw.. how the sponge will hung on the hair?? btw i thought the lucido-L thingy is to be sprayed before curling the hair using curling irons? it is meant to protect the hair from the heat. aiyu: welcome. thanks for the compliments. emily: it will miraculously be fastened after you twirl it. am not sure about short hair though. Great post I would love to try those curlers, I usually just use the old fashion sponge curlers. Wow great tips! I like curly hair and it looks good in you.